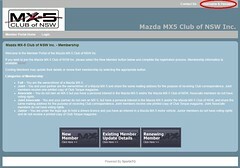 Thank you for your interest in membership of the Mazda MX-5 Club of NSW. You will find that participation in the Club's events is a rewarding experience and will ensure that you maximise the benefit from owning the world's most popular sports car – the Mazda MX-5. Please see Categories & Fees for information on the type of membership you desire and the appropriate fee. All members are supplied with a unique username for renewing membership and managing personal details in our Member Portal. You must set your own password by visiting the Member Portal and clicking "Username & Password" in the top-right corner of the page (see below). You will then see a webpage with options for "Password Retrieval" and "Username Retrieval" (see below). Enter your email address and username in the "Password Retrieval" section and you will be sent an email with a webpage link that you must click to reset your password. The webpage will look like the image below. Please ensure that you use a secure password so that your personal details are kept protected. If you cannot remember your username, enter your email address in the "Retrieve Username" section shown above. You will be sent an email with the username(s) attached to your email address. You can now reset your password by following the instruction in the above paragraph. Please note that the username must precisely match, including upper and lower case letters. we recommend copying & pasting the username into the webpage field. You are welcome to change your username to something that will be easier to remember. 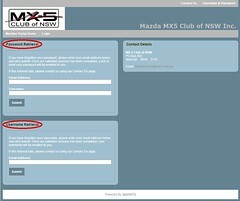 Simply visit the Member Portal, click the link for Existing Members, log in and then click the "Update My Details" link. Our membership system is provided by Sports TG. 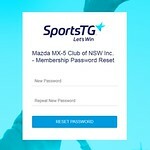 Charges to your credit card for membership and event payments will show STG Mazda MX-5 Club of NSW in the transaction description.